Mount your DSLR, mirrorless, cine, or ENG camera using this complete CX6 Head and 75 Sprinter II Carbon Fiber Tripod with Ground Spreader and Case system from Miller for your studio or field video production. 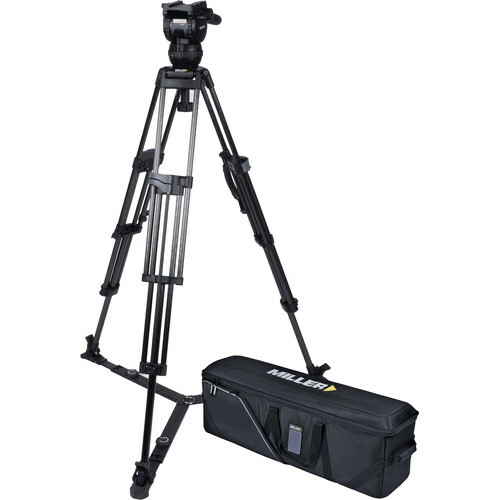 The system includes a CX6 fluid head, a fixed-length pan handle, a 75 Sprinter II carbon fiber tripod, a ground spreader, and a soft carry case. The CX6 fluid head features a 16-step counterbalance system, a 3-step pan/tilt drag, a side-load plate, and a maximum payload of 26.4 lb. The 75 Sprinter II carbon fiber tripod supports a maximum payload of up to 66.1 lb, features a 75mm bowl head and spiked feet, supports a ground spreader, and has a built-in carry handle. Read more below about the items in this kit. The Miller CX6 Fluid Head is designed to accommodate a wide payload range with 16 steps of counterbalance. Pan, tilt, and counterbalance can all be set to zero, enabling even the lightest of cameras to be supported. Maxed out, this head is rated to support camera setups up to 26.4 pounds, adequate for small cinema cameras with rigs or medium sized ENG camcorders. Securing your camera or rig is easy. The sideload plate design enables you to simply drop in your camera without the alignment issues posed by rear-loading variations. The plate offers 2.4" of sliding range to balance your rig. To survive fast-paced shooting environments, the CX6 is die-cast from a lightweight, yet durable metal alloy with composite polymers and precision ball-bearings for smooth mechanical operation. Even in harsh conditions, the CX6 will perform reliably. The base of the CX6 is a 75mm ball for mounting to compatible tripods and grip equipment. An illuminated bubble level makes it easy to level the CX6 in dark environments. A fixed length pan handle is included, and a second rosette is available for attaching an optional second pan handle.